There's something magical about local newscasts. The kooky weather people, the upwardly striving anchors, the uncomfortably enthusiastic sportcasters  they all come together to make a heady potion that reeks of ambition, sadness and desperation (with just a hint of unearned arrogance).  We didn't even mention the man who's convinced that he can see the Virgin Mary in the leg wound likely suffered when he fell off his bar stool ("You can actually almost see her holding the baby Jesus"). There are really only four reactions to "Finally Tonight, Jesus...." The first, and most obvious, is unbridled laughter. Faith in the face of great obstacles is no doubt noble, but there's only so many shots of people willing themselves to see something  anything  sacred amid the profane ("His neck is right here, here's the beard, the goatee, his eye, I think that's his eyebrow, this sorta looks like a mole...") before you burst into laughter. The second reaction is something akin to, "How long did it take this person to find all these clips and splice them together?" Reaction number three is obvious  mockery. But the fourth response is the most surprising. A sense of...pity? No. More like empathy for these poor news folk, who probably want nothing more than to expose corrupt assemblymen or be first on the scene for the next big meth lab bust. Instead, they're listening to some dude tell them about how they found something that looks like Jesus in the folds and shadows of the dirty shirt they tossed into the corner of their laundry room. 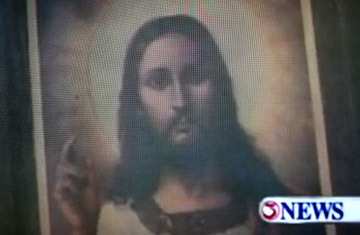 So when one newsman says, with barely disguised contempt, "Is that a holy image, or a bucket of filth? ", we understand his tone. Because, Cheesus  it's obviously a bucket of filth. Read "Who Is Craig? A TIME Investigation"